Satan is chasing me in all forms this week.? Damn Phil, you're a GREAT salesman. Phil, you want to give us some reasons why you like the LX series so much? Well, Alex, I'll take "LX Ski characteristics for $40 please".? But I also have a real comment.? Lynn's current skis are a 72 waist and she was thinking she wanted to be in the 66-68 range. Narrower would be better for tipping and edging drills and hard snow carving, wider would be better for east coast off-piste. While I haven't skied the 72, here is my review of the 82. I expect no different. Here is Scotts (Dawgcatching) review of the LX 82. I am still looking for Phils wihich I assume is up on Epic. Phil you forgot the link in your post. Kastle LX82 176cm: the new line from kastle: still a titanium laminate ski, but with tapered sidewalls and a bit more forgiving feel. The target customer of this ski is a little lower speed and performance, but still looking for a top-performing ski. Review: skis like an MX series, but softer, not quite as much stability, not quite as powerful. Very smooth, easy to ski at lower speeds, and stable up to reasonable 30mph or so speeds too. Very smooth; you just glide over the snow, and it is incredibly damp as well. You can open up this ski and rip on it, provided you aren?t skiing 50mph. Very responsive, just not quite as aggressive laterally. It fits into a range such as the Elan Magfire 78ti, K2 Recon, Salomon X-wing Tornado: good skis, but not the expert, top-end ski. I know a lot of people won?t allow their egos to ski a ?non top-end? ski such as this, but it is a very, very good ski, especially if you aren?t ripping up big arcs all day. Super responsive, more snap due to the lighter weight: this is going to be a winner. 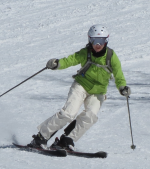 It was also the favorite ski tested of one of our other testers, who would describe himself as a ?terminal high-intermediate/cautious advanced skier?. He thought it had ?very good grip on the harder snow, and very smooth. Also extremely easy to ski. Best ski I tested, no surprise it was also the most expensive?. I would concur that this ski will make a lot of skiers happy. Phil, I did find your review over on epci and that description (and Dawgcatching's) of the ski is a good fit for Lynn as a skier, I think. Assuming, of course, that a review of an LX82 is a valid indicator of the LX72. The RX70 may fit her desires as well. I have not skied them. They sound like wonderful skis but I don't think they are what I am looking for. The FX 84's were wonderful skis for what they are designed for but I could definitley overpower them on hard snow. My fear with these would be that I would enjoy them but feel like something was lacking when I pushed to their limit on groomed terrain. The other thing that I pay alot of attention to is turn Radius. 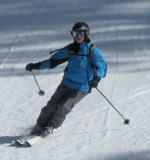 In a 50/50 or any ski where I will use it 50% or more time on groomed terrain, I am looking for ski with a tighter TR. This is one of the reasons that the Head IM 78 is such a great ski. It is stiff enough to hold up well in crud but soft enough to bend the tips and most importantly in the 177 length the TR is 15.5 (that's from memory). I am blessed with my current situation in MT where my home is on the slope. It's almsot like havimg a ski caddie. I can ski 10 different skis in one day, and sometimes do. I still would love to try most in the Kastle line. Looking forwrad to it. yeah, the FX line is not intended to be a dedicated groomer ski. It doesn't have the "race" genes the MX series or the RX series have. It's much more for BC or mountaineering skiing. This was one reason why I still scratch my head at the ratings on that ski and even the new 94. I didn't ski the 94 but to say its a better ski than the 88 is kind of a misnomer. Better how? at what? I am sticking to the MX88 as my daily driver based on it's performance on and off-piste and the full spectrum of snow conditions. I'm pretty sure that the MX series is made for me. The question would be the 88 vs the 78. I would love to try them both. I agree onthe FX. Wonderful backcountry ski but not really in the running vs more powerful skis for resort skiing.